The word Kigurumi comes from a combination of two Japanese words: kiru ("to wear") and nuigurumi ("stuffed toy"). 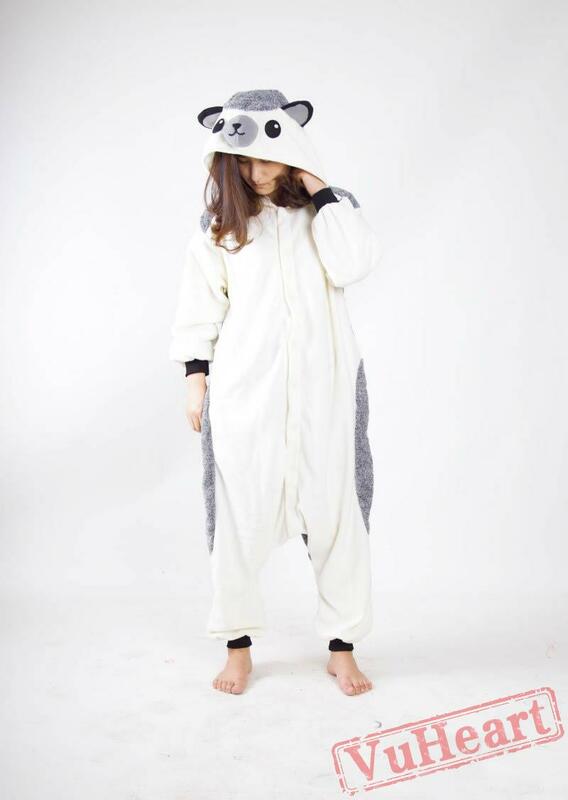 Looking at the pictures here, it's clear that donning a kigurumi instantly transforms you into an adorable animal. (Or in some cases, a skeleton!) Traditionally, kigurumi referred to the performers wearing the costume, but the word has since grown to include the costumes themselves. In Japan, kigurumi costumes are worn as a way to break the conventions of traditional dress or just as comfy pajamas! Animegao kigurumi, known colloquially as kigurumi, kigu or occasionally doller, is a type of cosplay which uses a masked character costume to portray anime or cartoon characters in the real world. The face of the performer is fully covered with a stylized mask, and the costume of the character is worn. Used in stage shows, the concept of animegao kigurumi was then adopted by cosplayers, who made custom masks of various characters. In Japan, most cosplayers refer to this style as (アニメ顔 - animegao, or "anime face"), while performers are sometimes called "dollers". It is still a very minor part of the cosplay scene in Japan, though around 2005, it began attracting attention in other countries, including the United States, Canada, and European countries. As with other kinds of cosplay, many hobbyists have costumes of established characters from games or animations. The characters are usually female, and commonly human, although kigurumi characters of other races and genders do exist, including male (such as Kenshin Himura from Rurouni Kenshin/Samurai X), mechanical (such as Gundam Wing), elfin (such as Deedlit or Pirotess from Lodoss), and demonic (such as Inuyasha from the anime of the same name). Some kigurumi are original characters created by the performer. By wearing a body suit and mask, kigurumi cosplayers are able to get closer to the appearance of the original character, especially in the case of animal characters or highly stylised characters. Nonprofessional animal kigurumi cosplayers (also known as "fursuiters" mostly by furries), painstakingly make detailed heads and bodies from foam, plastic, wire, artificial fur, and other materials. In animegao kigurumi, the performer playing a humanoid anime character wears a flesh-coloured body suit (known as a zentai) and matching mask usually moulded from clay or fiberglass composites.The body suit allows them less-detailed skin features, on the level of animated characters, and the mask allows a similar level of facial features. Some hobbyists obtain masks from established hobbyist mask studios.